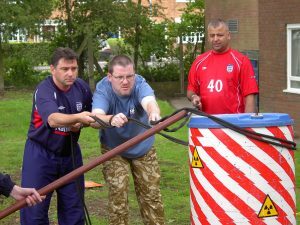 Running training activities is a key part of any learning event. This blog will provide you with a ten point checklist for running successful training activities. I recently attended a learning event as a learner, and the trainer was talking and then showed a video clip. My experiences are that 80% of people love watching a video as part of learning, however the trainer just stopped what they were saying, and played the video clip without an introduction. TV is a passive experience, so I guess we all went into passive mode; not what we usually want our learners to do. The trainer then asked us to get into groups and gave us all a brief. There was a lot of confusion, and the end result was that we all watched the clip again, this time with an active gaze focused on body language, which was what he wanted us to look at. As a facilitator, every day is a learning day. These things happen. But they can be avoided so I have drawn up a ten point checklist on how to run successful training activities. It is important that learners understand why the case study, activity, role play or video is important to them. I ran a customer service recovery event, and participants had started by sharing their most challenging customer they’d had recently. I set the scene by asking them a series of questions, culminating in ‘What’s the one thing you could have done differently, to make a 1% improvement?’. Improving their body language came out as a popular choice. At this point, you can then either state the learning outcome(s) for the session or ask the learners to state what outcomes will help them improve. I attended a seminar a while ago. As I walked into the theatre, which was nearly full, I had no choice but to sit in the front row. I was wearing a vivid colour, and I noticed the speaker look at me and smile. They chose me as their ‘volunteer’ (in fact I was drafted, as she just selected me) I think based on how I was dressed. I managed my surprise and nerves, however the learning for me was that as a trainer you should always state what roles you are looking for. This could be participants, observers, presenters, scribes, time keeper. Clarify their role; what they can do, and what they can’t do; time constraints, who is responsible for time, the outcome(s) from the task, any stresses they may have. I remember asking one group ‘What did you observe?’ and then being met with a row of blank faces. It turned out the organisation was highly structured, so the learning for me was to give a template for people to follow. I do that now, and always stress that it is a framework, and I always include the words ‘Anything else?’ on the template. I keep all my training activities in their own boxes now, together with my trainers notes for the session. For example, I have all the materials in one place for using my variation of the Stephen Covey jars/rocks/pebbles/sand/water exercise on prioritising our time. That way I can repack after each session confidently knowing I have all I need for the next time I use each of my training activities. Check everyone is clear as to what they are working on, and have everything they need. I also always have an alternative for people who are just not hooking into the activity. For instance, one group of learners didn’t want to do a ‘Newspaper Review’ of the previous day’s learning, and instead chose to film their review on their iphones as a micro learn. Keep to time, allow extra time if you sense the group wants to achieve, keep people within the boundaries and guidelines of the brief, coach and write notes if you don’t have observers. I also ask learners if I may take photos, as, although people grimace, they are a wonderful record of the event, and a memory peg to the learning. Where were the main challenges? Where did you spend most of your time? These are some examples. I find having some questions pre-planned, and then flowing with the remaining questions works for me in drawing out their learning points. I can always add in my learning points, based on my observations. ‘One thing I saw was…’; ‘energy appeared to be down when…’; ‘the point that appeared to be the creative nudge you needed to solve this came from…’. This is the key to training activities – our learners accepting, embracing, and committing to something new. I often find this is the weakest part of any training activities I take part in as a learner. It is great to chew over any activity we have just done, however the next chunk of time is critical in how we apply it. Goal – What is our objective here? Reality – What happens at work/ what just happened? Options – What can we do differently? Will – What will we do? You might provide a template with these questions, encourage peer coaching, individual commitments, a letter to the future self…the main thing is that you are allowing time within your training activities for your learners to embrace the learning experience, and decide what will happen differently in the future. If there is enough time, I sometimes ask if a simulation, or a re-run of the activity will help embed the learning and enhance the motivation to change. I hope this checklist helps you run successful activities. I look forward to your comments. Please leave them at the foot of this page. Download a copy of the Activities Checklist now. The Development Company is on a mission to save the world from boring learning – whether that is face to face learning, or elearning. Talk to us about designing and delivering an experiential session for your people. 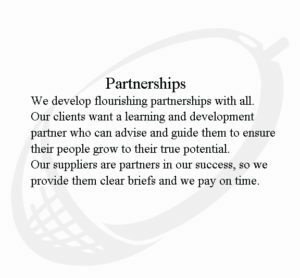 We have an online level 5 Training qualification that follows all 4 adult learning principles – the Certificate in Training & Development (CTD). It is engaging and pragmatic in focus. 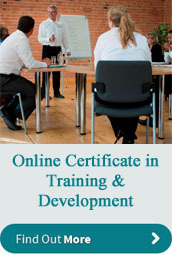 Contact us if you’d like to get a professional qualification. Or would you like a demo of our online CTD course.